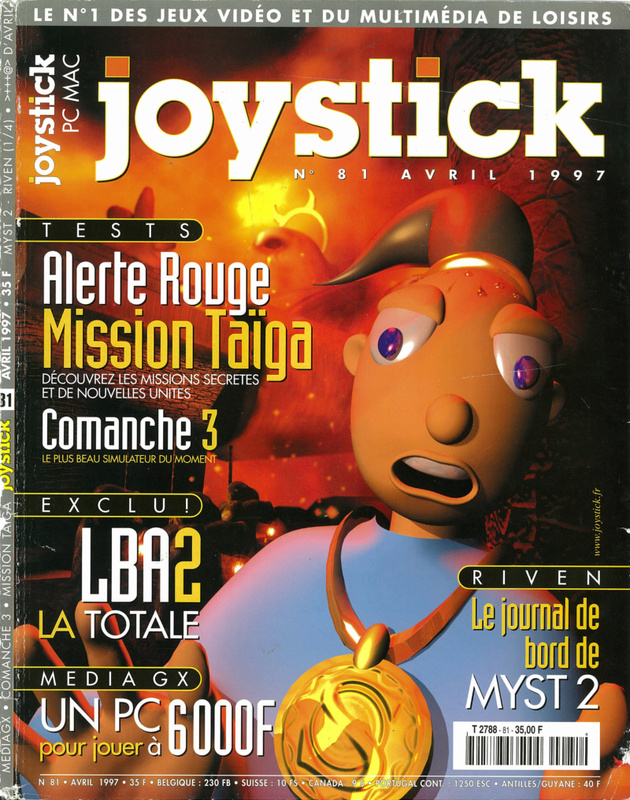 This was in the French magazine "Joystick", April 1997 issue. "Ahlalala long, gonna make you sweat." "LBA2 doesn't just have Adeline-created characters. Look, our old friends Ernie and Bert are here having some drinks." That's right! 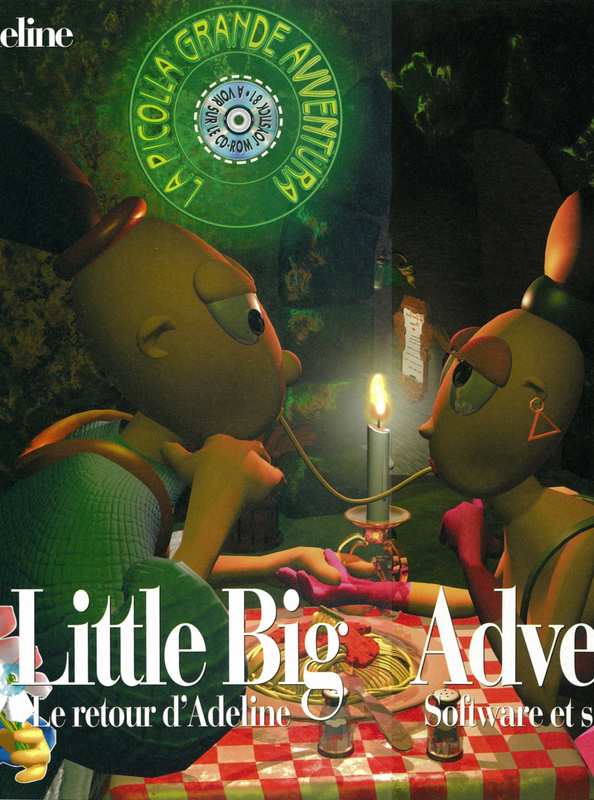 Before release, Ernie and Bert seemed like they were going to cameo in LBA2. Last edited by Gaucelm; 2019-01-28 at 17:14. Very nice finds! Good job Gaucelm!! I think I remember some of those, but I don't see them in the main site. I join main pages so there was no sign from page cut. Hey, maybe I could do a translation some day. "Twinsen is back, to our great delight. 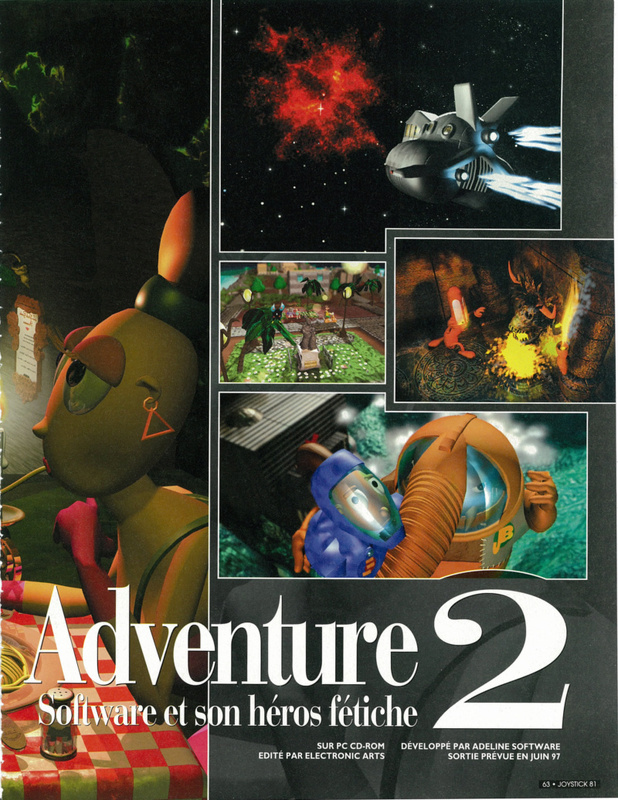 The people at Adeline Software have given life to him once more before throwing him into, naughty as they are, another dangerous adventure cleverly titled Little Big Adventure 2 (LBA2). Thus, we took our good old train towards Lyon in order to pay a visit to the talented Adeline Software team (see the coverage on our CD), that some - including us - consider to be one of the best game development team in the world. And LBA2 could only convince anyone who is hesitant about that." 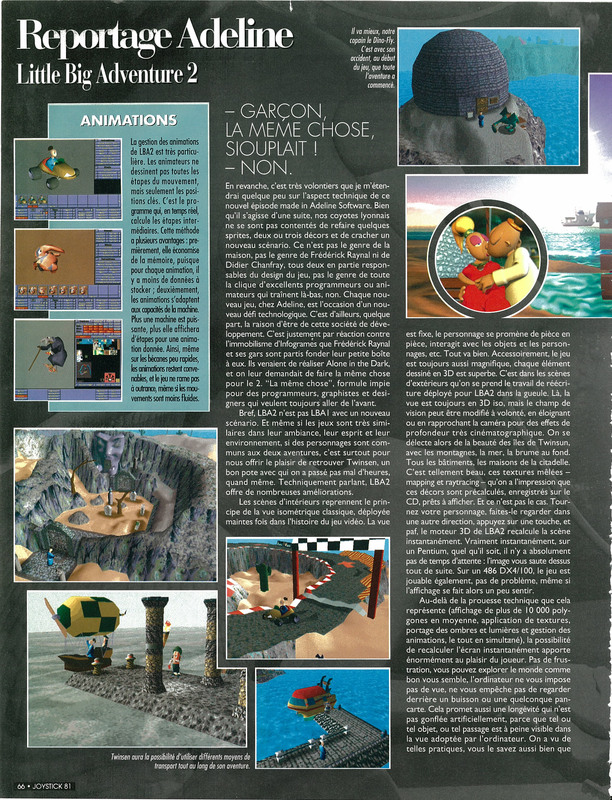 Top left: "Adeline feature story - by Seb"
"Little Big Adventure 2: the Return of Adeline Software and their favorite hero"
Published by Electronic Arts - Planned Release for June 97"
I think I done with this one :] Thanks a lot Gaucelm for translation. What do you guys think about final result ? Looks like the original! there is one small mistake in the text - (...)in order to pay a visit to thetalented Adeline Software team'. 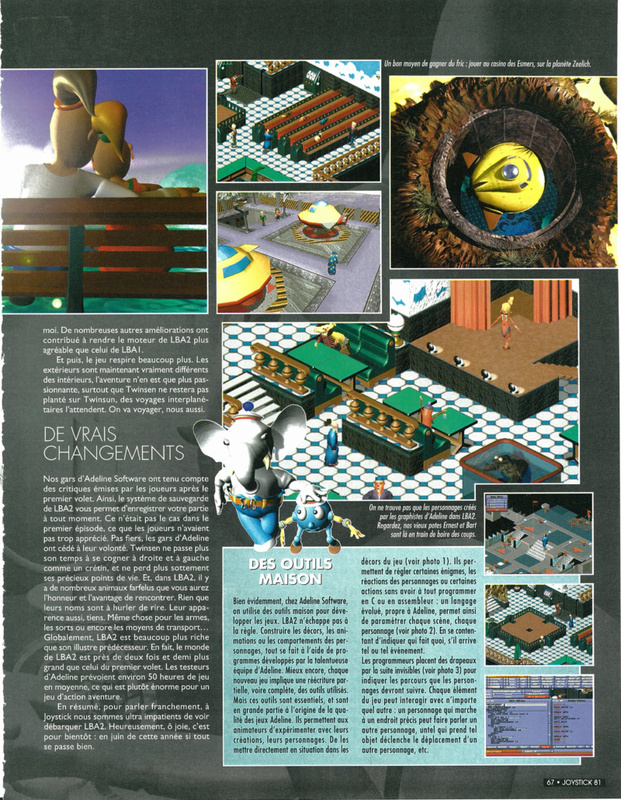 (small text near top right screencap): "Transparency and more or less see-through texture effects are applied in LBA2." 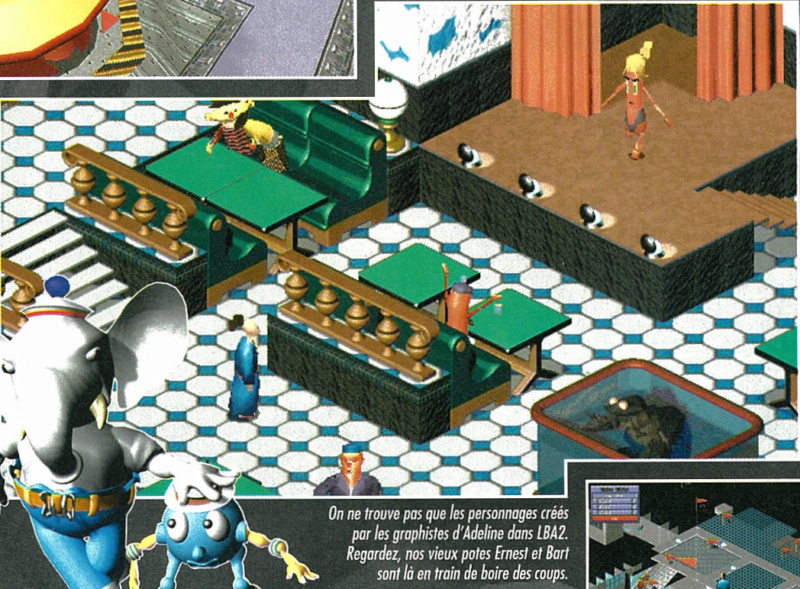 (small text near lower left screencap): "We thought pétanque barely reached across other countries; turns out it reaches across other galaxies. Unless, considering this is Adeline we are speaking about, it is bocce volo." - More weapons and spells"
"Previously, we left Twinsen, the hero of LBA1, in the best situation there is. Beloved by his fellow Twinsunians that he saved from the clutches of evil dictator Funfrock, Twinsen quickly became a global hero. Everything was all fine and cutesy. 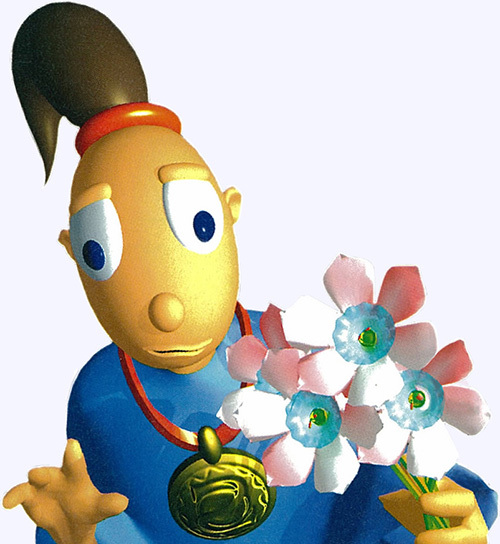 Statues of Twinsen bloomed across the small planet, some streets began to bear his name, including maybe a school, a park bench or a public garden... In short, peace, calm and serenity wonderfully reigned over Twinsun. Just like our good hero who saved the planet with magic, the people of Twinsun grew a passion for this strange art form: they all wanted to become wizards, and thus a trend was revived. Weather wizard, bike-repairing wizard, healer wizard, dog-walker wizard, whatever wizard, they all found something to specialize in. Regardless, the Twinsunians were happy. And perhaps Twinsen was even more so, as his girlfriend Zoé saw her belly suddenly become - boing - bigger. Happy events were just around the corner; another tiny Twinsen was soon going to populate this lovely planet and his room was already ready. Everything is doing well, and yet the LBA2 adventure begins with an unusual event for the peaceful Twinsun planet; a violent storm breaks out. Everybody rushes back home, worried about such severe weather and unaccustomed to the rain. 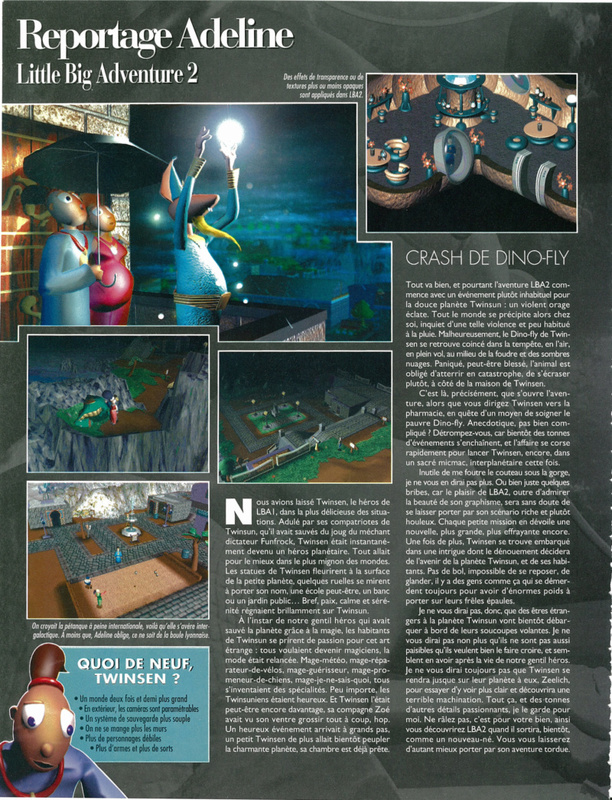 Unfortunately, Twinsen's Dino-Fly gets stuck in the storm while flying up in the air, amid lightning and dark clouds. Terrified, maybe even wounded, the creature is forced to crash land near Twinsen's house. This is the precise moment where the adventure starts, as you move Twinsen towards the pharmacy, searching for a way to heal the poor Dino-fly. Sounds simple, trivial? Think again, because soon, many events follow, and things get rough for Twinsen who, once again, gets into another fine mess... a space-level mess. No need to put a gun to my head, I won't tell more. 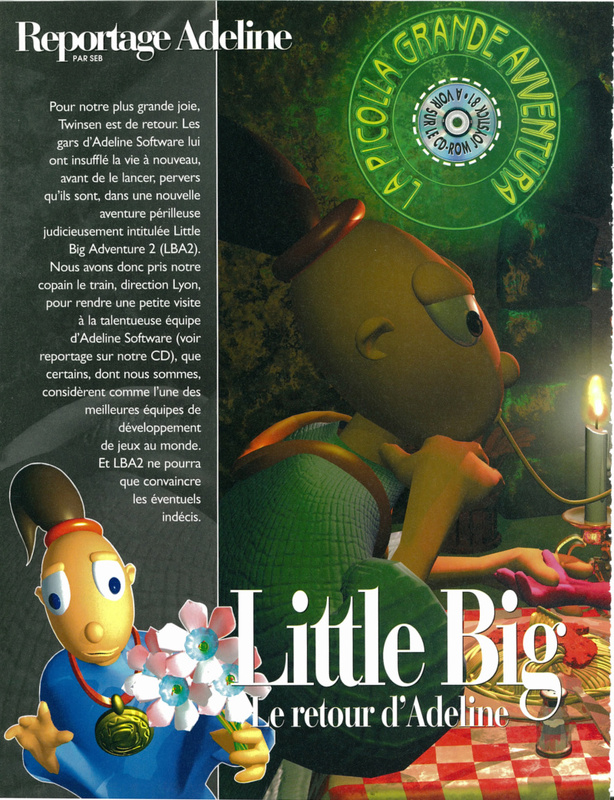 Or just a few tidbits, because the joy of LBA2, apart from contemplating its beautiful graphics, will probably be its deep and frantic storyline. Each little quest unveils a new one, a bigger one, a scarier one. Once again, Twinsen finds himself in a plot where the outcome shall decide the future of planet Twinsen and its inhabitants. Tough luck, you can't rest or sit around; some people always manage to have goddamn heavy trouble weighing on their shoulders. Therefore, I won't tell you that non-Twinsunian alien beings will soon land aboard their flying saucers. I won't tell you either that they are not as peaceful as they'd like you to believe, and seem like they are after our good hero's life. I still won't tell you that Twinsen will go to their own planet, Zeelich, so that he can sort things out and uncover a horrifying conspiracy. I'll keep all of this and other interesting details for myself. Don't get mad, this is for your own good, so that you'll discover LBA2 when it will be released, soon, like a newborn baby. You will enjoy the crazy ride even better." Nice find ! Who are Ernest and Bart though ? Puppet characters from the children's show "Sesame Street". I will try to make english version of other pages soon (got little bit busy recently).